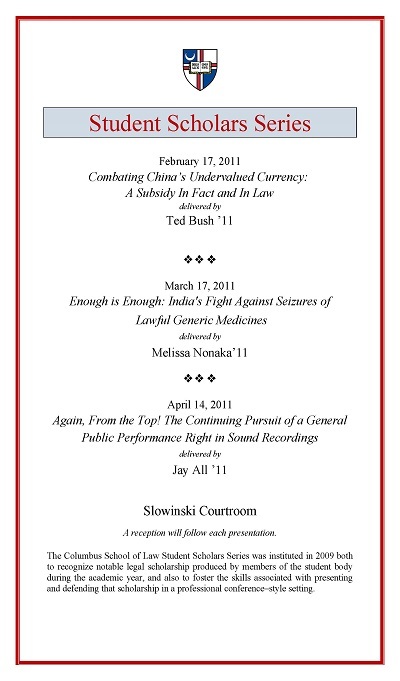 This Feb. 17th lecture inaugurating the Columbus School of Law's 2011 Student Scholar Series was delivered by third-year law student Ted Bush. A former Capitol Hill staff member who specialized in international trade policy, Bush argued persuasively for a careful reexamination of Chinese exchange rate policy, which has been blamed for the record bilateral trade deficit between the United States and China and the loss of U.S. manufacturing jobs. Bush said the Commerce Department has existing authority to bring countervailing duties against China, and should do so because that nation's undervaluation of its exchange rate constitutes a continuing illegal export subsidy. Bush, Ted, "Combating China’s Undervalued Currency: A Subsidy In Fact and In Law" (2011). Student Scholar Series. 7.